I wanted to go sort of minimalist this year with my wrapping, but still keep it light and fun. Done and done. 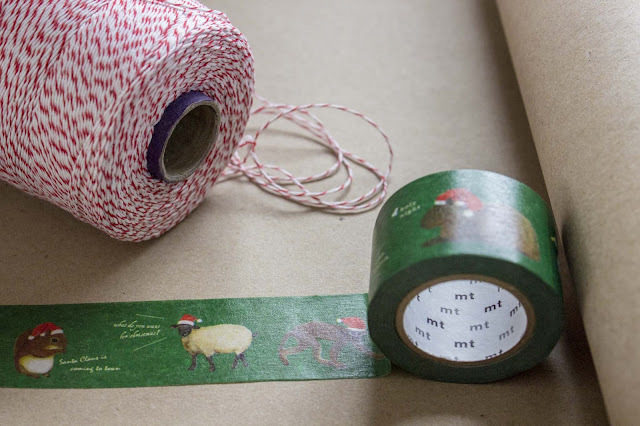 Baker's twine, a big roll of butcher's paper, and some holiday washi. So easy, so satisfying. I actually love wrapping gifts, something so meditative about the process for me. How about you? Do you go big with bows and glitter? Or keep things simple? Labels: amazon, crafts, DIY, etsy, family, gifts, holidays, photos by d.
I keep it simple... mainly because I just don't have the skills(haha). But I really like the simpler look. Your idea is so nice! It reminds me of old packages. Thanks Samii! Sometimes old school is the best way to go. Well waddya know, great minds think alike! Merry Christmas Anya! 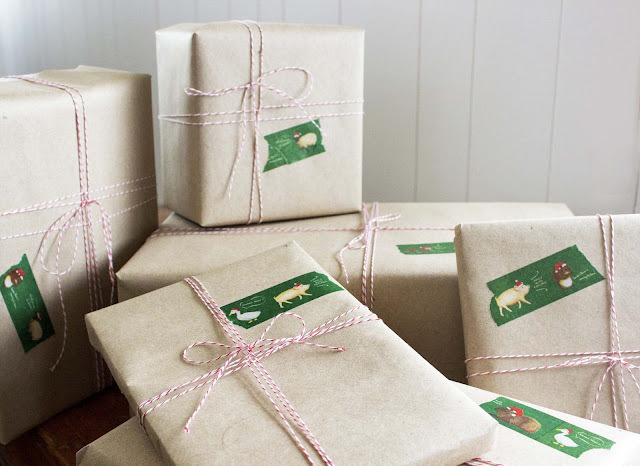 Great wrapping idea! I still have to wrap my presents ;) Check me out sometime. Thanks Sue, and a very merry Christmas to you and your family as well! Glad to have made your cyber-acquaintance this past month! Took a look at your post and while I can't read what it says the photo is lovely! Thanks for stopping by! I totally did something similar (but used black & white bakers twine, and made my own tags)! I seem to always use craft paper...it just makes everything else pop. Your tags are ridiculous! So detailed, so much care! Kinda makes my slap-some-washi-on technique seem lackadaisical... Still, thanks for stopping by! LOVE THIS POST :). I am so FOLLOWING. I hope you can check out my site: http://theproverbs.net and follow as well. So we can keep posted on each other. Thanks for your time. Hope to hear from you soon...God Bless! Love the way you've wrapped your presents! They look so festive but simple. I normally go for brash loud paper with Santa Clauses all over them. Ha! For years I used the same paper every christmas, waiting to see the end of the roll (which never came, a miracle? a curse? ), bright red and green, covered in those troll dolls all dressed up as santas. The epitome of class and minimalism. About time I tried something different! Really nice !! I love it!!!!! Thanks! Or substitute some other kind of washi and use it year-round! ¿Te ha gustado? Me lo compré embarazada, no veas lo bien que me vino! Oh wowww , I always love cute wrappings , but honestly I am too lazy to wrap for others on my own!! Thank you! And thanks so much for stopping by, I'm a big follower of your blog so it's nice to see you over here!